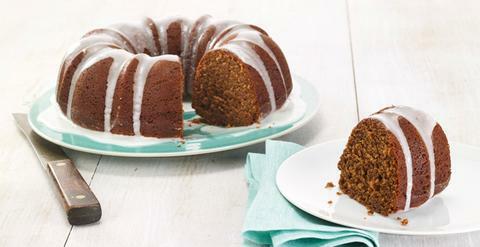 Who needs cookies when you can have a gingerbread bundt cake? This recipe is Santa and FitKit approved! Whisk together flour, spices, baking powder, baking soda and salt. Whisk together eggs and brown sugar. Add molasses and 1½ c Chobani. Stir in flour mixture and then oil. Pour Chobani mixture into greased Bundt pan and bake at 350°F until cake tester comes out clean, 45-55 minutes. Cool then unmold onto cake plate. Whisk remaining 3 T Chobani with powdered sugar and drizzle over cake. Let set 15 minutes before slicing.